The original Postal succeeded in driving the mainstream press into an apoplectic rage, who devoted many column inches to decrying its controversial nature. They took issue with the fact that the game's protagonist roamed around gunning down civilians and officers of the law, rather than aliens or another more acceptable foe. Indeed, the game's somewhat controversial nature acted as a potential obstacle to anyone looking to judge it on its own merit. But now, nearly twenty years later, Postal's developers have seen fit to release an updated version of their contentious oeuvre, titled 'Postal Redux'. This has also afforded me the opportunity to evaluate the game, without any of the associated controversy that was present upon its initial release. Unfortunately, viewed in the cold light of day, it just isn't very good. 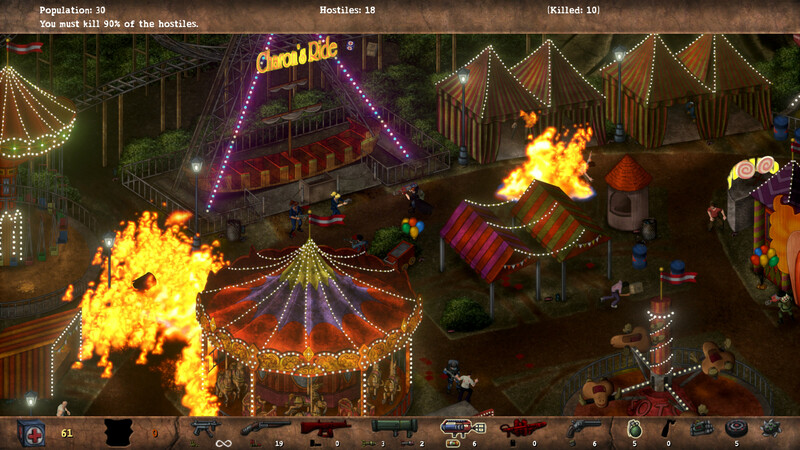 The apparent premise behind Postal Redux, taken straight from the game's store page, is that you '.. take control of The Postal Dude as he fights to survive in a world gone mad with violence. ' I found this interesting as it implied the main character wasn't entirely responsible for the resultant carnage. While I wasn't particularly taken with Postal 2, the original game's sequel, it did sport a rather intriguing pacifism option. Yet the above assertion rings hollow when the first level requires you to eliminate 90% of the level's law enforcement officers in order to proceed. 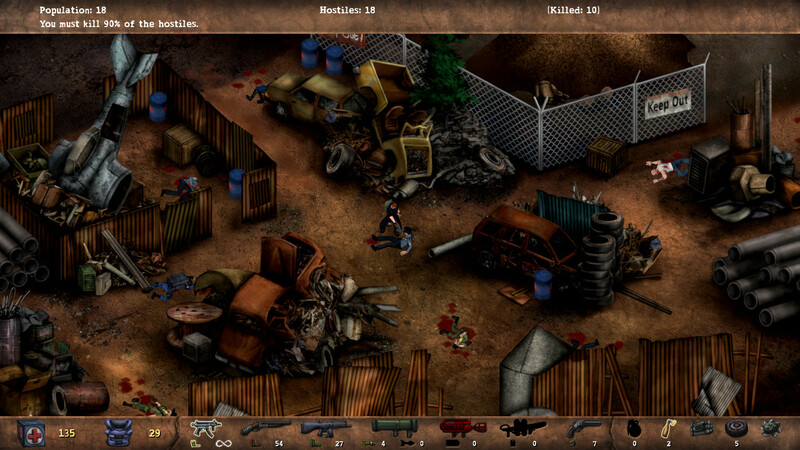 Postal Redux is a twin-stick shooter – though I had no problem using the keyboard and mouse - where you slaughter your way through several small-town locales. The action is mostly viewed from an isometric perspective, although the camera is zoomed out to such a degree that I found it hard to distinguish between individual characters. I found myself accidentally shooting civilians because I couldn't tell if they were the 'hostiles' that the game was urging me to eliminate. I didn't feel morally conflicted about my actions however, because my victims' protestations were delivered with all the conviction of someone reading out their shopping list. The protagonist's vocal delivery was equally lacklustre, leading to me wonder just why he'd bothered picking up his submachine gun at all. Yet, having played Postal Redux, I can understand his apparent apathy. The game started with the main character standing outside his house, surrounded by the police. Fingers tensed, I waited for them to make their move, fully prepared to defend myself against ever-growing waves of incoming cops. But they never moved an inch. It was only when I stepped past my gate that they took any action, firing pot-shots at me, which my character was easily able to absorb. I fired a couple of salvos back, dispatching the hapless officers and waited once more. Nothing happened. It became apparent that I had to come to the enemies, rather than the other way around. This may have made sense in most contexts, but it seemed a little odd given that my character posed a threat to civilian populace. So I proceeded through the game's opening level, dealing with enemies by getting close enough to see them but not so close that they had a good chance of hitting me. Any enemies that did pursue me typically did so alone, allowing me to pick them off with ease. Granted, they would have overwhelmed me if they all attacked at once, but the 'rinse and repeat' approach of shooting and then backing off did not make for a compelling experience. By the time I reached the fourth level, tedium was starting to set in. 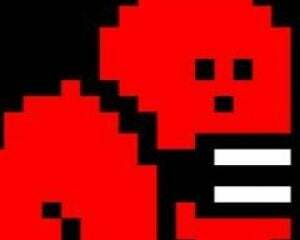 When I did die it was because I'd got so bored with the repetitive nature of the game that I'd just barged into an area to see what would happen. Postal Redux's levels are also somewhat unremarkable. There are seventeen main levels in total and while their visual appearance varies from location to location, they can only be viewed from one angle due to the game's fixed camera. This means that enemies will often disappear from view behind buildings, turning into grey shadows that are hard to pick out. Given that you can take a great many hits before expiring, this doesn't pose a life-threatening problem, but it can be somewhat frustrating. 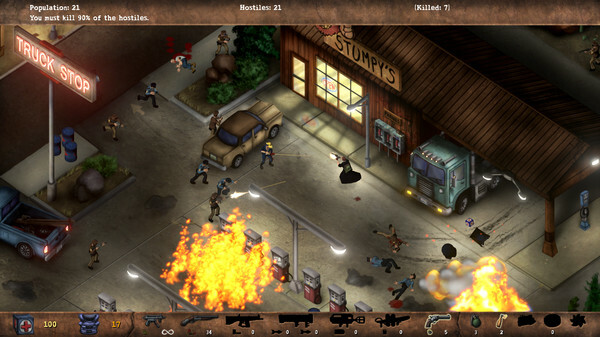 Main campaign aside, Postal Redux sports a score-based rampage mode which was not present in the original game. I found this mode to be marginally more accessible than the game's main campaign, though it did little to kindle my interest in the game. Even acquiring a flamethrower, something that would normally fill me with glee, was something of a non-event. The main game also allows you to pick up new weapons but given that your submachine gun has infinite ammo, there's little incentive to do so. Notable by its absence is the trademark dark humour that made Postal 2 a halfway interesting game. Instead, all we get in Postal Redux are smatterings of bad Goth poetry between each level. The lack of any sympathetic or halfway interesting characters was the final nail in the Postal Redux's coffin, eliminating any desire I had to persevere with the game. Stripped of the controversy surrounding its initial release, this modern day update reveals the game's mediocrity. An uninspiring affair, Postal Redux failed to engage me on any level.